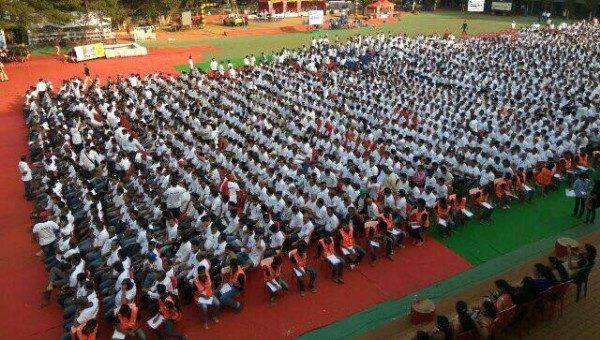 The largest school reunion is 3,638 former pupils, achieved by St. Paul’s High School (India), in Karnataka, India, on 17 December 2016. The event was called the “Paulite Rally”. The Guinness world records has officially put this up on its website today. St. Paul’s High School Belagavi which was founded in 1856 now holds the World record for the largest school reunion in the world. As many as 3638 past students and teachers gathered at the St.Paul’s school ground in Camp to create a history of sorts on 17 December 2016. The event was organised to mark the glorious accomplishment of the school completing 160 years, the alumni have set out to repay its alma-mater by setting a world record for the highest number of ex-students attending a school reunion. 3638 Ex-students (Paulites), old teachers and staff from the batch of 1943 to 2016 of St Paul’s school came together in past students alumni meet and set new Guinness world record of biggest re-union by breaking previous record of 3299 ex-students re-union held by Stadium school of Washington, USA in 2006. We are yet to officially get the printed letter from the Guinness world records, but it should arrive in some time, currently its website is updated and we very elated with this news. Our efforts have paid off, we had to do some meticulous planning for the event and later each and every of the 3638 pupils data was verified which was a daunting task for us. But if there no pain then there is no Gain. Today it feels so good that our efforts of each of the Paulites have been paid off. The committee takes this opportunity to Thank each and everyone associated with this event for their contribution and support. “Paulite Rally” – Hearty congratulations. I’m a proud product of St Paul’s right from baby class till SSLC In 1964. I was in school when we celebrated 100 years. If I recall correctly,Fr George Rego was the Principal and Fr. Eddie Menazes was vice principal.